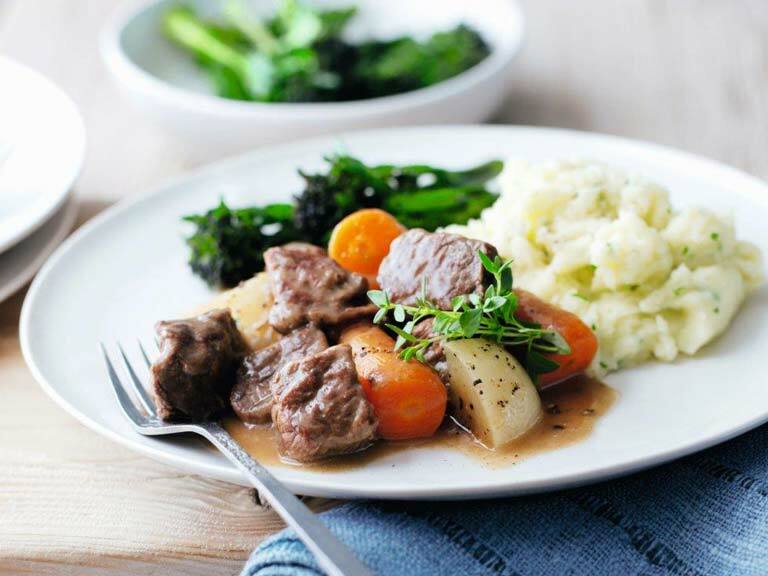 A slow-cooked braised beef recipe that's perfect for using cheaper cuts of beef, such as shin or chuck steak. 1. Place the beef in a large bowl and season. 2. Heat the oil in a large non–stick frying pan and cook the beef in batches for 3-4 minutes until brown. Transfer to a 1.2L/2pint ovenproof casserole dish. 3. In the same frying pan cook the onion, garlic and ginger for 2-3 minutes over a moderate heat until soft but not coloured, transfer to the casserole dish. Add the remaining ingredients, except the vegetables, bring to the boil, reduce the heat, cover and cook in the oven at Gas mark 3, 170°C, 325°F or on the hob for 1½-2 hours. 4. 25 minutes before the end of the cooking time add the vegetables to the casserole dish and continue to cook. 5. Remove the star anise, garnish with the fresh thyme leaves and serve with herb mash and seasonal vegetables.